Director George Butler’s IMAX documentary takes the audience to Mars to see the red planet through the eyes of the Spirit and Opportunity Mars Rovers, with score by Philip Glass. 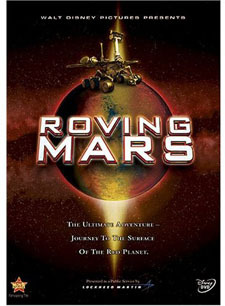 Roving Mars is an exciting adventure that follows the journey of NASA’s Mars Exploration Rovers through the eyes of scientists and engineers at the Jet Propulsion Laboratory and Steve Squyres, the lead science investigator from Cornell University. Their collective dream of Mars exploration came true when two rovers landed on Mars and began their scientific quest to understand whether Mars ever could have been a habitat for life. Since the 1960s, when humans began sending the first tentative interplanetary probes out into the solar system, two-thirds of all missions to Mars have failed. The technical challenges are tremendous: building robots that can withstand the tremendous shaking of launch; six months in the deep cold of space; a hurtling descent through the atmosphere (going from 10,000 miles per hour to 0 in only six minutes! ); bouncing as high as a three-story building on the first touchdown; and then bouncing again and again to a gentle stop, safe on Mars. It is no wonder that NASA decided to name the twin robot geologists, the Mars Exploration Rovers, Spirit and Opportunity. They represent the hopes and vision of men and women who worked against great odds to bring to lifeamission in searchof answers to the history of water on Mars, and whether the red planet ever could have sustained life. This movie details the development of Spirit and Opportunity from their assembly through their fantastic discoveries, discoveries that have set the pace for a whole new era of Mars exploration: from the search for habitats to the search for past or present life… and maybe even to human exploration one day. Having lasted many times longer than their original plan of 90 Martian days (sols), Spirit and Opportunity have confirmed that water persisted on Mars, and that a Martian habitat for life is a possibility. While they continue their studies, what lies ahead are NASA missions that not only “follow the water” on Mars,but also “follow the carbon,” a building block of life. In the next decade,precision landers and rovers may even search for evidence of life itself, either signs of past microbial lifein the rock record or signs of past or present life where reserves of water ice lie beneath the Martian surface today. It will take the next generation of explorers, those in classrooms today, to continue on this path of great discovery. released by Walt Disney Pictures.